Sporting a day's stubble on his chin, Tom Petty strode into a conference room at his manager's West Hollywood, Calif., office and lit up a smoke. Though the singer was an hour late for a scheduled interview, he offered no excuses, only a heartfelt apology. It was an endearingly honest moment from a singer whose music is noted for its sincerity. 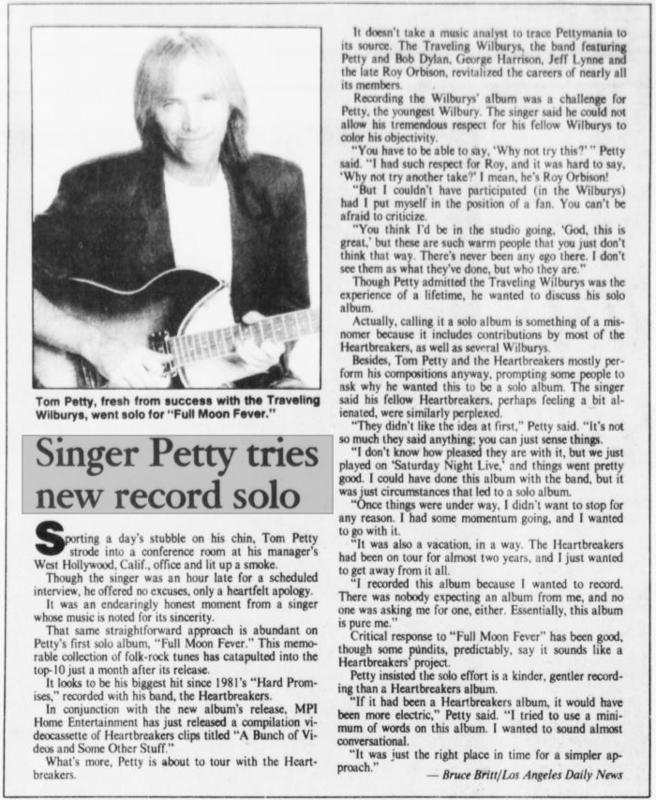 That same straightforward approach is abundant on Petty's first solo album, "Full Moon Fever." This memorable collection of folk-rock tunes has catapulted into the top-10 just a month after its release. It looks to be his biggest hit since 1981's "Hard Promises," recorded with his band, the Heartbreakers. In conjunction with the new album's release, MPI Home Entertainment has just released a compilation videocasette of Heartbreakers clips titled "A Bunch of Videos and Some Other Stuff." What's more, Petty is about to tour with the Heartbreakers. It doesn't take a music analyst to trace Pettymania to its source. The Traveling Wilburys, the band featuring Petty and Bob Dylan, George Harrison, Jeff Lynne, and the late Roy Orbison, revitalized the careers of nearly all its members. Recording the Wilburys' album was a challenge for Petty, the youngest Wilbury. The singer said he could not allow his tremendous respect for his fellow Wilburys to color his objectivity. "You have to be able to say, 'Why not try this?'" Petty said. "I had such respect for Roy, and it was hard to say, 'Why not try another take?' I mean, he's Roy Orbison! "But I couldn't have participated (in the Wilburys) had I put myself in the position of a fan. You can't be afraid to criticize. "You think I'd be in the studio going, "God, this is great,' but these are such warm people that you just don't think that way. There's never been any ego there. I don't see them as what they've done, but who they are." Though Petty admitted the Traveling Wilburys was the experience of a lifetime, he wanted to discuss his solo album. Actually, calling it a solo album is something of a misnomer because it includes contributions by most of the Heartbreakers, as well as several Wilburys. Besides, Tom Petty and the Heartbreakers mostly perform his compositions anyway, prompting some some people to ask why he wanted this to be a solo album. The singer said his fellow Heartbreakers, perhaps feeling a bit alienated, were similarly perplexed. "They didn't like the idea at first," Petty said. "It's not so much they said anything; you can just sense things. "Once things were under way, I didn't want to stop for any reason. I had some momentum going, and I wanted to go with it. "I was also a vacation, in a way. The Heartbreakers had been on tour for almost two years, and I just wanted to get away from it all. "I recorded this album because I wanted to record. There was nobody expecting an album from me, and no one was asking me for one, either. Essentially, this album is pure me." Critical response to "Full Moon Fever" has been good, though some pundits, predictably, say it sounds like a Heartbreakers' project. Petty insisted the solo effort is a kinder, gentler recording than a Heartbreakers album. 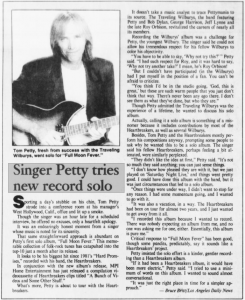 "If it had been a Heartbreakers album, it would have been more electric," Petty said. "I tried to use a minimum of words on this album. I wanted to sound almost conversational. "It was just the right place in time for a simpler approach."